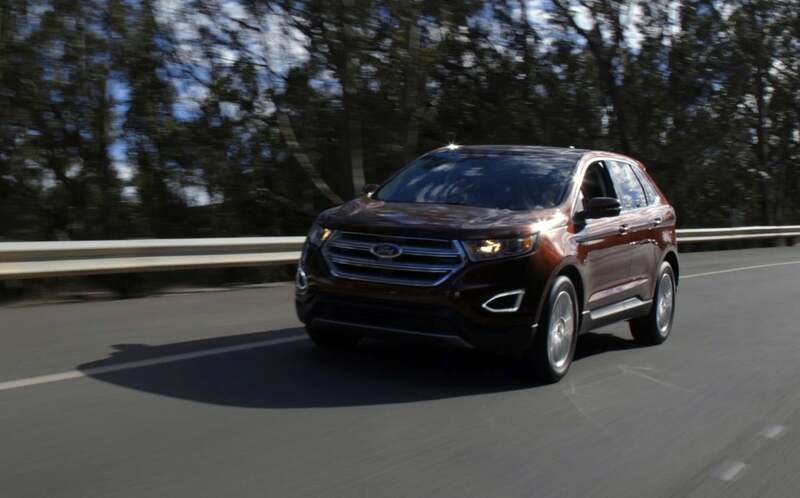 The 2015 Ford Edge crossover is packed with useful high-tech driving aids. It just can't always park itself, so keep your eyes on the road, and hands on the wheel. My hands aren’t touching the steering wheel. The car is parking itself. It’s an unsettling experience, but I’m trying to give technology a chance. 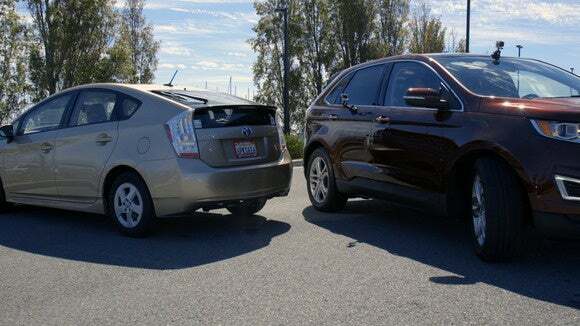 Even when the 2015 Ford Edge successfully maneuvers itself booty-first into a perpendicular parking spot, all you can do is grip your seat bolsters and think about insurance deductibles. But what happens when the Edge isn’t so successful? Well, then you have to wrest control from the machine, and park your own damn self. 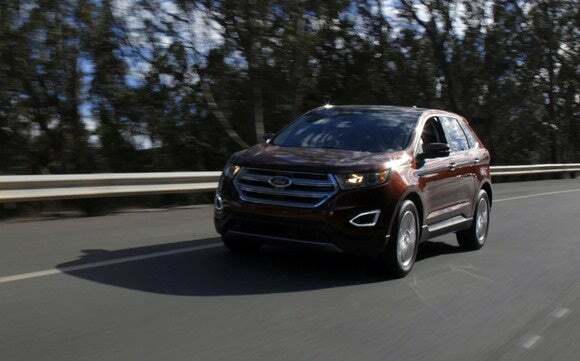 Ford’s high-tech driver-assist features have a lot to offer in toto, but when they don’t deliver, you might as well be driving a ‘68 Ford Bronco. Dig it: If your brain is hard-wired to believe man is master of all machinery, and robots require laws, and humankind must fight to the bloody end when Skynet rains hellfire, then you won’t warmly embrace the computer-controlled driver-assist features from Ford and its competitors. Shoot, I was taught two hands on the wheel. But this? The Edge’s computer told my co-worker it would be OK to park into a trash bin. Note that even obstacle detection shows she’s heading for trouble. Low-level discomfort washes into something more alarming when Ford’s automatic parking feature puts the Edge on a collision course with a trash bin, motorcycle or immovable metal pylon. Last week, the tech press breathlessly celebrated the promising future of driverless cars, but at the very same time I was exploring the embryonic present of driverless technology, and it wasn’t always confidence-inspiring. But let’s start with the good news. Aside from unreliable parking-assist, the fully optioned Ford Edge includes a nice collection of driving aids that give me hope. So let’s first explore these positives (you can jump to the section titled “Not so enhanced parking assist” for a peek at what happens when crossovers go rogue). Selling for a suggested MSRP of $43,585, my Edge Titanium loaner didn’t come with Ford’s 315-horsepower turbo V6, but I did get the playfully named Equipment Group 302A, which includes a Blind Spot Information System, Lane Departure Warnings, Lane Keeping Assist, a front-mounted 180-degree camera, obstacle sensors, and the aforementioned Enhanced Park Assist system that gives me robot-apocalypse night sweats. Note the amber LED on the left side of the mirror. Someone’s in my blind spot. Not all this technology is new for 2015—but it was new to me. My daily driver/dog ferry is a 2015 Subaru Forester XT, and its high-tech driving-aid story begins and ends with a back-up camera. My 2005 Lotus Elise track car has even fewer electronic assistants—there’s no traction control, stability control, or even cruise control (and I had to option electric windows). So these are my baselines. Know that going in. It turns out I love a number of Ford’s features, and I wish I had them in my Forester. 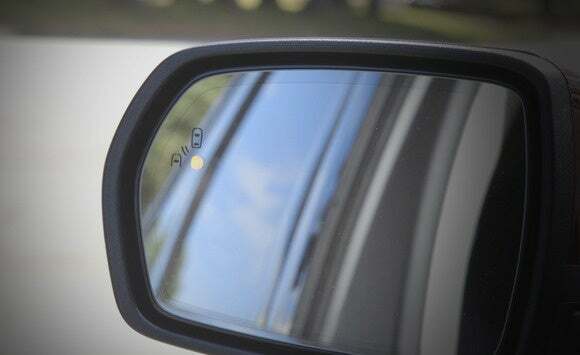 The Blind Spot Information System takes the form of a simple LEDs situated on your side mirrors. When another car enters the Edge’s formidable blind spot, the LED lights up, giving you a bit more visual information on those unpredictable free agents lurking in adjoining lanes. 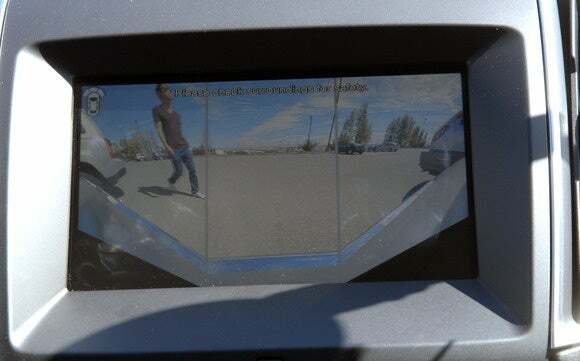 The system should never replace an over-the-shoulder glance before changing lanes, but it’s a great value-add, and can teach you more about your blind spot locations. The 180-degree front camera. Most of what you see beyond the left and right hash marks is beyond the scope of human vision from the driver’s seat. I also appreciated Ford’s 180-degree front camera, which literally peaks around corners and nearby cars to give you a view of cross-traffic. Imagine you’ve backed into a perpendicular parking space, and you’re rubbing shoulders with two behemoth SUVs on either side. Lacking the front camera, you have to pull out ever-so-gingerly, lest you T-bone an approaching car, or smack a pedestrian. But with the camera set to its wide field of view, you have a second set of eyes via the display on your center console. Tech like this should be standard on all cars. My steering wheel... it’s vibrating? My Edge loaner vehicle was also equipped with ultrasonic obstacle sensors that detect imminent low-speed impacts, 360 degrees around the car. The system came in handy when negotiating Ford’s barge through the narrow apertures of parking garages, or even tandem parking in my own garage. Because the Edge is so large, it’s difficult to tell where it begins and ends, so the sensors are welcome. Sure, you have to endure a lot of flashing lights and incessant beeping, but that’s a small price to pay to stay out of trouble. 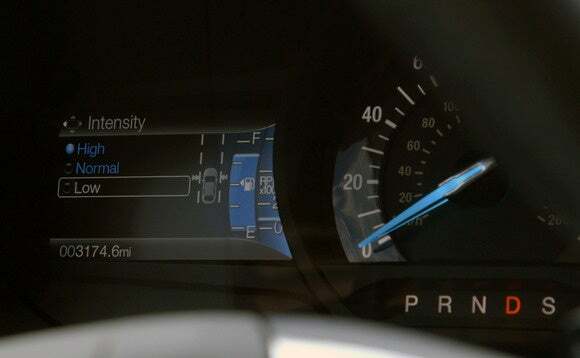 Ford’s obstacle sensors come in handy when you’re negotiating tight spaces. When the blocks surrounding the center console pictograph turn from yellow to red, you really need to stop. I was less enthused with Ford’s lane-keeping nannies, but still support them in concept—especially because they’re relatively adjustable, and even when set to 11, they’re still not excessively unnerving. The concept is pretty simple: The system uses a front-mounted camera to detect lane markings on the road, and when you drift over a line, you feel a vibration in the steering wheel. This lets you know you’re a sociopath who cares more about texting, eating, electric-shaving or applying mascara than the welfare of fellow motorists. So that’s the Lane Departure Warning component. There are three intensity settings for the vibrations, but I found even the High setting to be too subtle to capture my attention. An audible ping might be necessary to rouse some offenders. The only visual indication of a breached lane is on the left side of your steering wheel—the broken-line lane marker turns from green to yellow (and evetually to red). 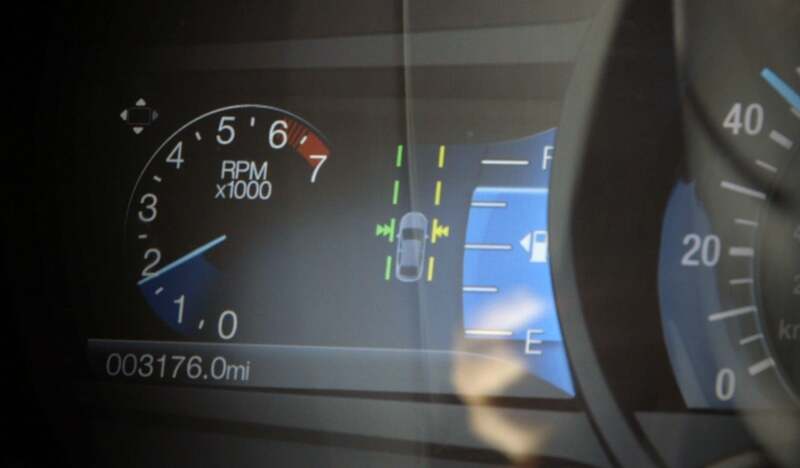 Decidedly less subtle is Ford’s Lane Keeping Assist feature. When it’s toggled on, the car’s steering system will take control of the wheel, and gently nudge you back into the correct lane as soon as you begin to drift. It feels like a magnet is carefully pulling you back to safety. Is it weird? Yes. Did it make feel like OMG WTF IS HAPPENING?! No. On face value, these lane-keeping tricks should offend me on philosophical level. But in practice, I never had a problem with them. Some evidence shows early iterations of lane-departure safety aids haven’t made drivers any safer. But my gut instincts tell me motorists need as many “you’re driving like a dumbass” alerts as they can get. If you don’t like the lane-keeping features, you can dilute the system, or turn it off entirely. In addition to three levels of vibrations and the ability to toggle off Lane Keeping Assist, all the lane-keeping tech can be shut down entirely via a prominent button on a steering column stalk. Also, the system doesn’t even kick in unless you’re driving faster than 40 mph, or if you’ve activated a turn signal. The Edge’s headline robo-feature is Enhanced Parking Assist. 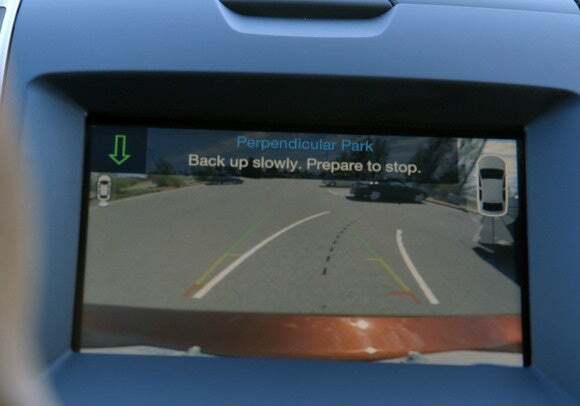 Earlier systems only automated parallel parking, but Ford’s latest version will back the car into a perpendicular space. Let me describe how it works—with reality checks. Find a spot: You start by double-pressing the parking assist button as you slowly creep through a parking lot. The system will scan for appropriate spots. Reality check: The system ignores plenty of perfectly suitable spots. I sometimes had to “trick it,” driving forward and back, to make it recognize the spot I wanted. Indeed, sometimes only one spot is suitable, like when you need to park in front of a specific house for loading or unloading. 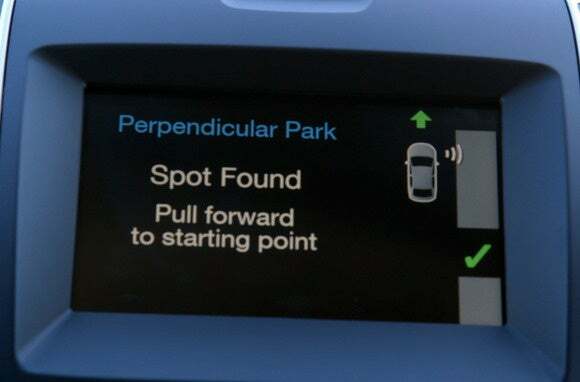 Press the parking assist button twice to tell the system you want to park perpendicularly. 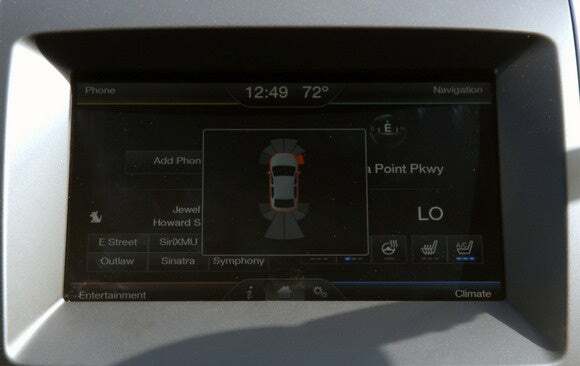 Pull forward: Once you’ve identified your target spot, the console display tells you to drive forward to start the parking maneuver. Reality check: You have to drive really far forward, like by a number of car lengths. The upshot is that your strange driving behavior doesn’t signal familiar intent to other drivers. It makes you look like you have no interest in your target spot, leaving the door open for others to swoop in, and snag your spot nose-first. Now pull forward—farther forward that what feels comfortable. Back the car in: But, OK, let’s say the coast is clear. Once you’ve pulled forward, you take your hands completely off the steering wheel, and then use only the gas and brake pedals to maneuver in, booty-first. The car’s ultrasonic sensors and computer will back you in with just right the steering angle (in theory). Reality check: This is a slow, unnerving, and often ill-fated process. Now back in slowly. Keep your hands off the wheel, or it doesn’t work. Second, because the car’s sensory awareness is actually much better than a human’s, it can cut very close to neighboring cars without the risk of damage. This creates spine-tingling moments where you see imminent doom in your mirrors, but the center console tells you all is clear. As such, the backing-in process proceeds sloooowly. Because who can you trust? Third, the computer is surprisingly fallible. Executive editor Melissa Riofrio and I tested the Edge for a number of days, and we both found that Enhanced Parking Assist would direct us into spaces that just weren’t free and clear. She would have hit a dumpster had she not aborted the Edge’s recommended collision course. I would have hit a parked motorcycle. And another car. In its owner’s manual, Ford reminds us that man must ultimately remain master of machine: “At all times, you are responsible for controlling your vehicle, supervising the system, and intervening if required.” Still, knowing what we know about the utter recklessness, and fecklessness, and willingness to fail of American drivers, shouldn’t the system be just a little bit smarter? Can we really reach autonomy by 2020? Some car buyers want it all. They will walk into a dealership, and demand the fully loaded baller ride that’s been optioned to the hilt. These folks should get Equipment Group 302A. It’s packed with some really nice features, and even if Enhanced Parking Assist doesn’t always work, it can’t hurt—unless you let it. The rest of Ford’s customers? They should tell the company they want specific features a la carte. I’d option the front-mounted camera, the full array of obstacle sensors, and Blind Spot Information System, in that order. Manufacturers like to group options into packages for efficiencies of scale, so my suggestion is really just a theoretical. But one can dream. The rest of us? We need to think about what the Ford Edge means in a world where some predict self-driving cars are just five years away. That’s the timeline projection of Ford CEO Mark Fields, who explains his position here, with caveats. 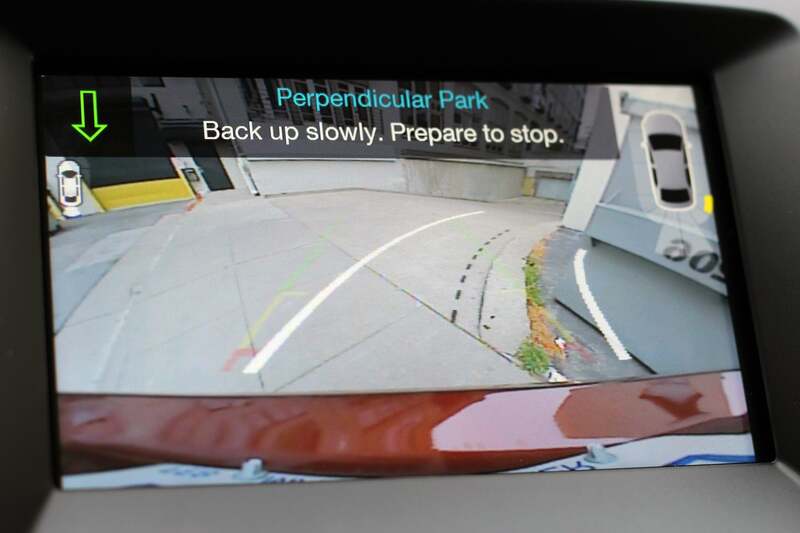 Is it possible that parking is actually the most difficult challenge for a self-driving car? Can a Ford, Tesla or Google really bridge the performance gap between a state-of-the-art parking assist system in 2015 and a no-excuses driverless car in 2020? And how will the hard-wired brains of long-time drivers take to autonomous vehicles—unless the experience truly “feels a bit like riding in a gondola,” as BuzzFeed’s Mat Honan wrote of Google’s effort last week? Self-driving cars are inevitable. That’s the conventional wisdom. And it’s a valid position considering the unstoppable forward march of technology. But when’s the last time your laptop crashed? Or the last time an app froze? Or the last time your cable went out? Or the last time your automatic parking system told you to back into a motorcycle—despite the fact that, wait a second, there’s a motorcycle right there? Ford, Google, Tesla, and every other automotive manufacturer with skin in the game has a lot to figure out. Fingers crossed they can get it done before we’re all fighting for gasoline on Fury Road. If the Ford Edge tells me anything, it’s that a five-year timeline is crazypants, and even 2025 is brazenly optimistic.